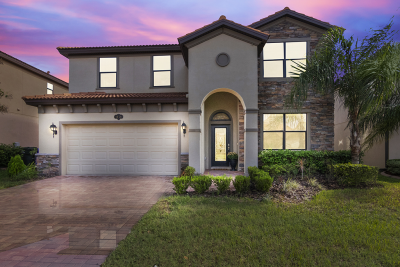 This chic, like new, 2 story custom built open floor plan home is situated in the affordable luxury gated community of Terralargo perfect for the Orlando/Tampa commute. This 5 bedroom home has lots of curb appeal with its tiled roof, stone features and paved driveway and walkway. The formal dining room with large windows is off the foyer and perfect size for entertaining. The kitchen features designer chocolate solid wood cabinets with chrome hardware and built in wine rack, stainless steel appliances, granite counter tops and large pantry. From the kitchen you can look into a home office or homework room. The laundry room has shelving and situated downstairs. Also from the kitchen you have a large family room and eat in area with sliding glass doors out to the patio overlooking the large backyard. The master bedroom suite is downstairs and has a huge walk in closet. The master bath has chocolate wood vanities, granite counter tops, double vanity sinks, large walk in shower and soaking tub. The other large 4 bedrooms are upstairs with 2 full size bathrooms. The upstairs loft has large windows and can be used as playroom, 2nd family room or exercise room. This amazing and very active Terralargo lifestyle is perfect for everyone. This lush and private community offers a resort lifestyle with zero-depth entry pool, well-appointed fitness center, fenced and covered playground, and gazebo situated on the banks of Meadow View Lake. Close to 98N and I4 for easy commute to Orlando or Tampa.